Our third of four 2018 offerings in our series of daily all-tourney teams. Note: We love it when defensemen picks fall into our lap. Edina star Sammy Walker might have nightmares about the play of Kleive for a while. 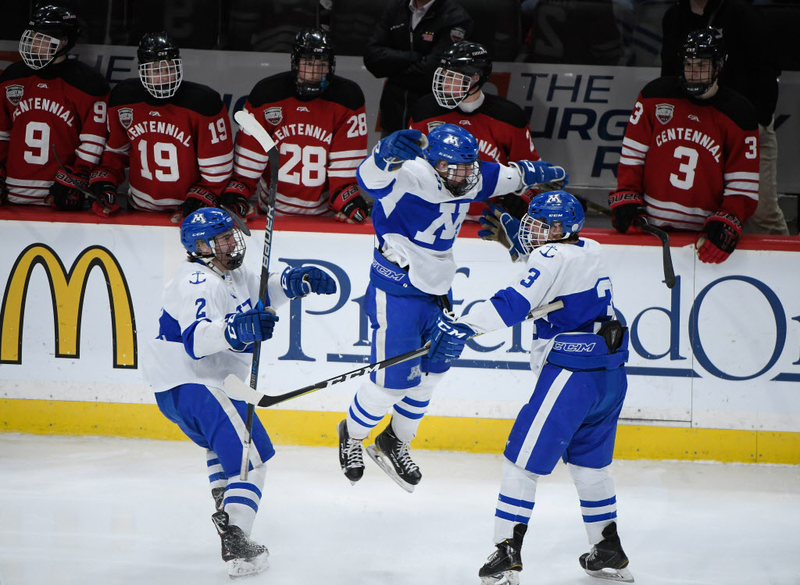 On a play that typified the night for Edina, Walker was swinging from the side of the net to the front, but his plan to wheel around Kleive was foiled by the headfirst dive and pokecheck from the Greyhounds senior. Kleive finished with 24 saves, many of them of the spectacular variety. Alexandria didn’t just defend favored Hermantown, the Cardinals attacked. Powell, a defenseman, tallied a hat trick, including a coast-to-coast beauty. Powell can’t recall tallying a previous hat trick. Cardinals’ fans won’t soon forget this one, which propelled the program to its first stat championship game appearance. You might not find a more clutch scoring defenseman this postseason. He scored twice against Centennial, the first one tying the game 2-2. The Skippers were attempting a long pass across the slot and when the puck got deflected, the instinctual Luedtke had a backhand shot waiting. He scored the game-winner in overtime of the section playoffs and had three assists in the quarterfinals. Hat trick by the power forward helped boost the Spartans to a 4-0 lead. His calm, “we-can-do-this” demenor on the bench after Mahtomedi rallied to force overtime might have been as important as his scoring. Two more goals for the Greyhounds sniper, including an important one early that ignited the Duluth East bench and its massive cheering section. He also scored into an empty net, giving him five tournament goals in two games. Shorthanded breakaway goal was a thing of beauty, as he deposited not only the puck in the net, but also tossed his stick there for good measure. He had two goals, giving him four for the tournament.